Welcome to Turtle Cay! Yes, this is the actual property where you will stay when you book with us! The sectional sofa has a pull out queen sleeper. Mr. Turtle is the coolest foot stool you've ever seen. We named the condo after him! 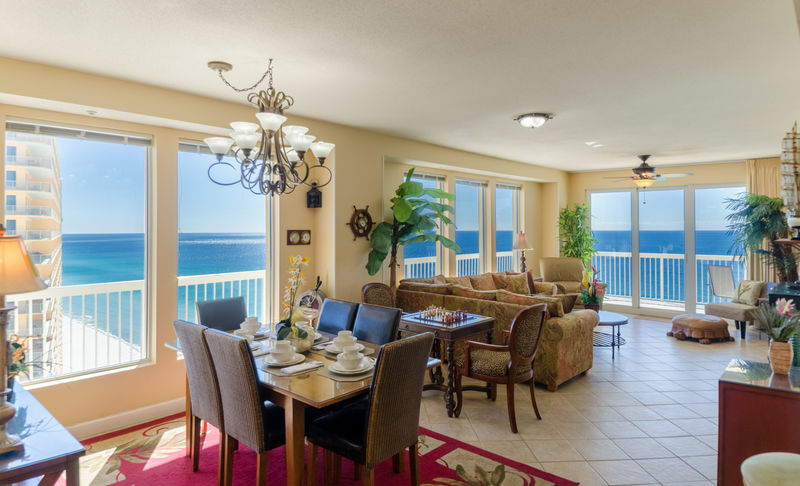 The elegant tropical/nautical décor will definitely make this your Perfect Place in Paradise! The great room TV is great for watching your favorite programs or the big game! Enjoy a game of Chess or Checkers at the game table or just relax on this huge sectional sofa. The great room in this fabulous wrap around unit is like the bridge of a ship. You can see the beach and the lagoon from everywhere! The Seychelles Master Suite king bed has luxury high thread count sheets and a memory foam topper so, you'll feel like you are sleeping on a cloud! The Seychelles Master Suite overlooks the majestic Gulf of Mexico. You'll be sleeping to the sounds of the ocean! 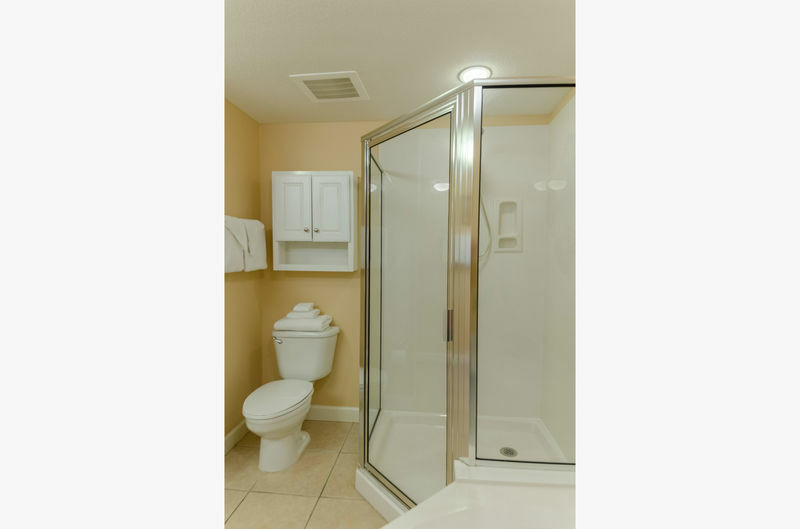 Master bathroom's has walk-in shower will let you wash the day's cares away! 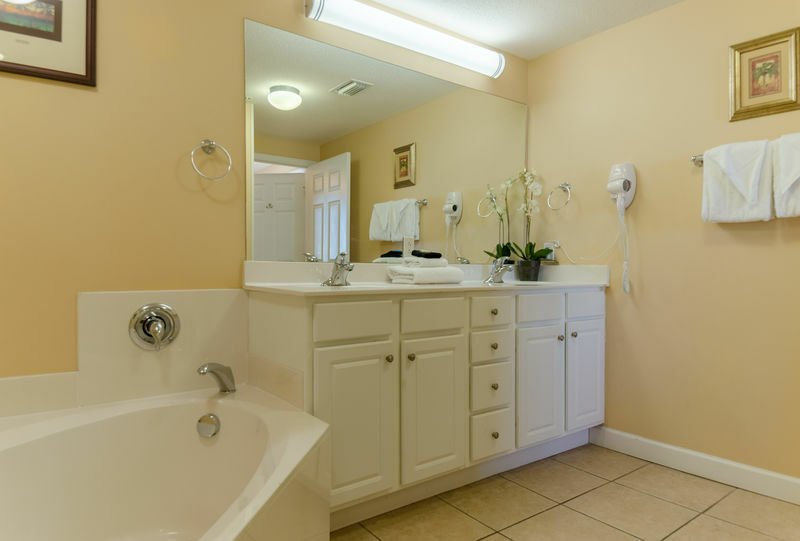 Master bathroom's large garden tub! Double vanities and plenty of lighting in the spacious en suite Master Bath. The gourmet kitchen has everything you need to prepare snacks or full course meals and extra seating on swivel bar stools, too! Both drip and Keurig coffee makers are provided. The views from the kitchen are great, too. The washer/dryer is adjacent to the kitchen. The Grand Lagoon Bedroom has a large flat-screen TV as well! The Grand Lagoon bedroom's luxury king sized bed overlooks Grand Lagoon and has it's own balcony seating area. The Grand Lagoon bedroom has luxury high thread count sheets and a memory foam topper too! The Grand Lagoon bathroom adjoins the Grand Lagoon bedroom with a private entry for that room. There is also a door for access to the hallway. 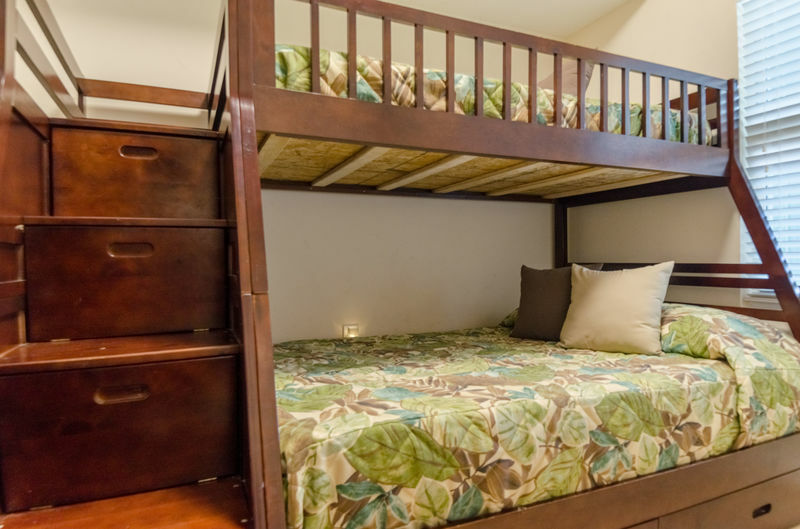 The Crew's Quarters bedroom is great for the kids with a twin over full bunk bed. The kids have their own TV, too. The ocean, the pass or the lagoon, you choose. The views are panoramic from inside the condo and outside on the wrap around balcony. The wrap around balcony goes all the way around the end of the building. What an amazing view!! Watch the rays play, the dolphins jump and the boats come and go from your shaded balcony. 2 large pools, 2 hot tubs, and a spacious sunning deck make this your Perfect Place in Paradise! Floorplan. Please see our photos for actual furniture arrangement. 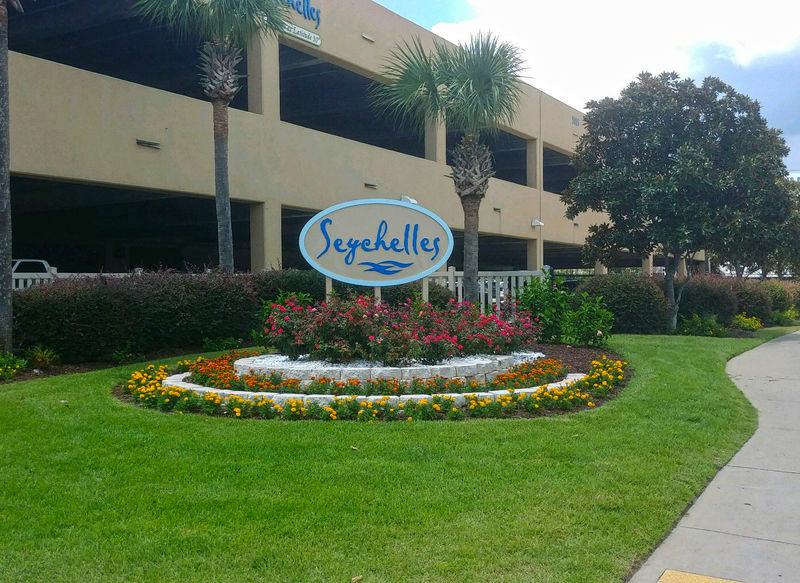 Welcome to Seychelles Beach Resort in Panama City Beach, FL. Paradise at Latitude 30! Picture yourselves in our beachfront 3 bedroom, 2 bath wrap around condo named Turtle Cay, Seychelles 1801, located in the fabulous Seychelles Resort. If you're looking for a quieter place to relax and have fun too, Seychelles is the place for your vacation. 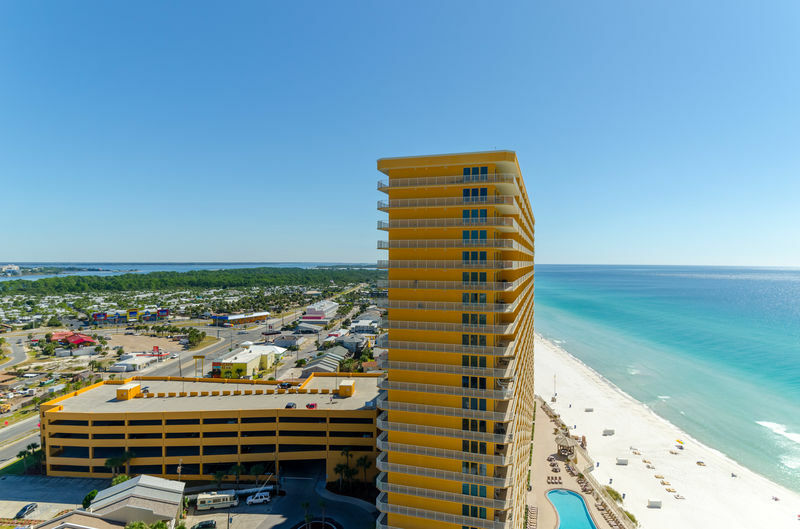 Close to fine and casual restaurants and all the attractions that make Panama City Beach so much fun. This property has the "WOW" factor you are looking for! We've provided all the comforts of home and then some. We like to hear our guests say upon arrival 'this is just like the photos we saw on your website. Comfortably sleeps up to 8 guests, 4 in 2 king beds, 2 on the queen sleeper sofa and 2 on the twin over full bunk beds just for the kids. The great room is decorated in elegant nautical style. 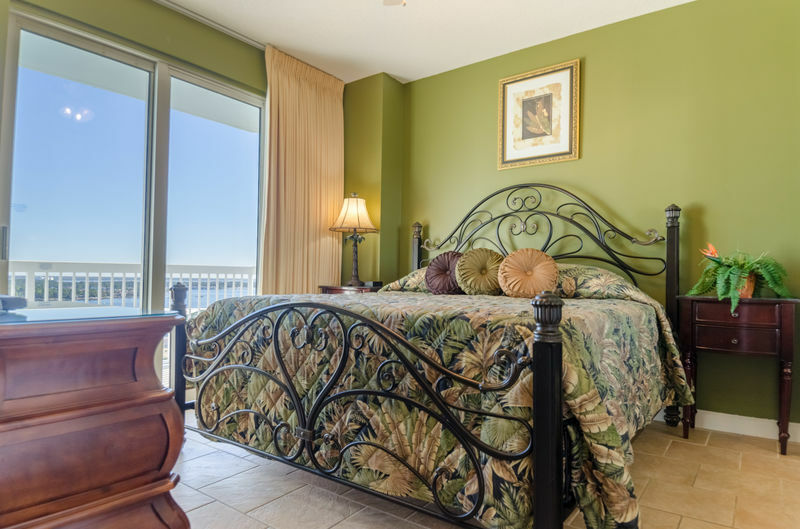 This huge room boasts a sweeping sectional sleeper sofa, flat screen 52' TV and the most spectacular views of Grand Lagoon and The Gulf Of Mexico anywhere on the beach. See the Pass and Shell Island from the panoramic windows and your wrap around balcony. Watch the large ships arrive and depart through the pass. Enjoy both sunrise and sunset. If you're lucky enough to be here when the moon is full, you are in a very special treat. Meet Mr. Turtle, our ottoman. He's always the kids' favorite! Step out on to your incredible wrap around balcony! 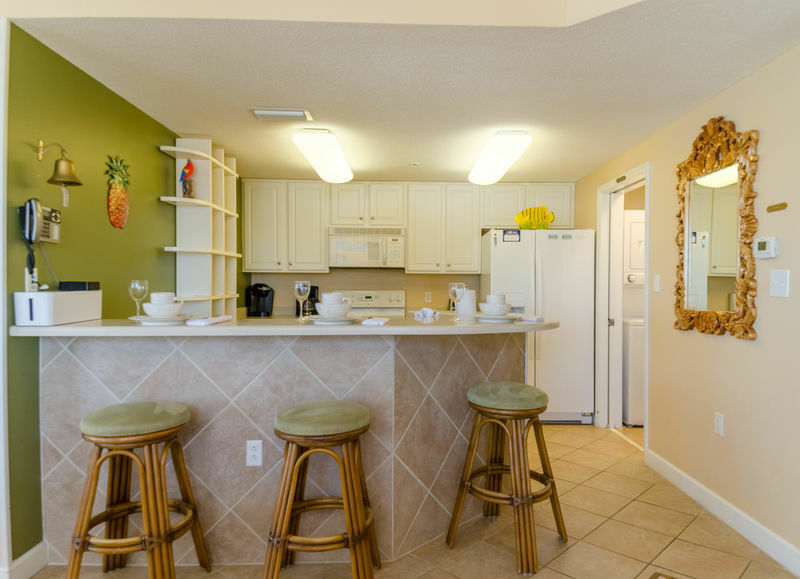 Furnished with plenty of chairs and tables so you can enjoy coffee in the morning, watching the beach action all day long and checking out the incredible Gulf sunsets. You can walk all the way around the building to see Grand Lagoon, too. Fabulous view! Your nautical dining table seats 6 with an amazing view! The chandelier harkens back to bygone days at sea! You'll feel like the captain of the ship when you are dining here. Check out the ship's telegraph and the chart on the wall that shows the way from the Bay, through the Pass and out to the open ocean. 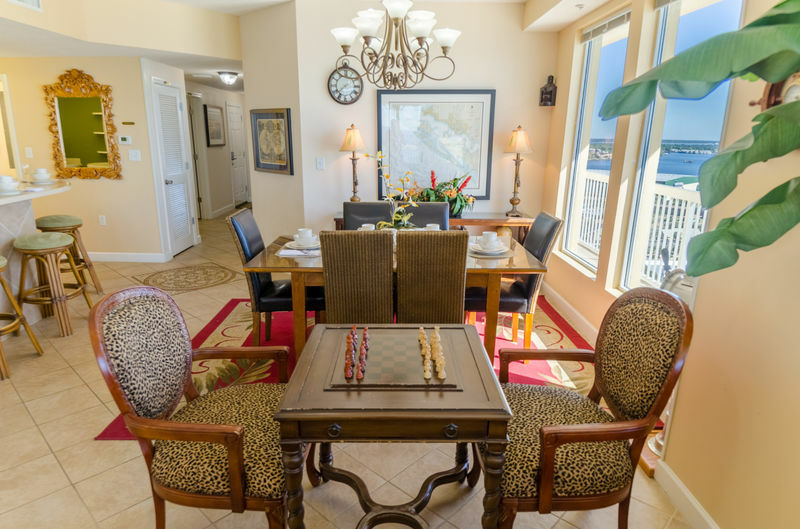 Take time out to enjoy a game of chess or checkers on the game table, too. Totally amazing! 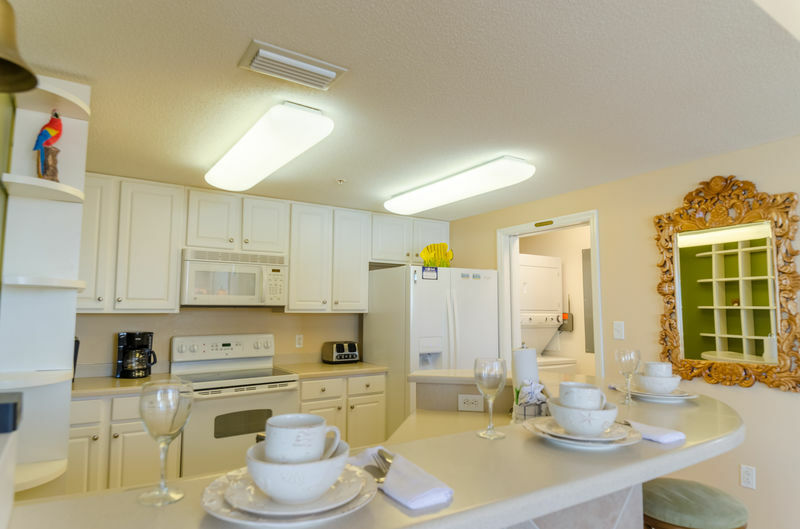 The large gourmet kitchen has a view, too and an an eat-in breakfast bar with swivel barstools for more seating. This kitchen is well equipped to prepare everything from a fancy meal to a simple snack. We provide all the dishes, glasses, flatware, cookware and bakeware you'll need. We have both drip and Keurig coffee makers. The stacked laundry set is located just off the kitchen for your convenience. We also provide an iron and ironing board for your convenience. The Seychelles Master Suite is your beachfront oasis with a luxurious king-sized bed with a memory foam topper and silky high thread count sheets. A large flat screen TV makes this your private oasis. 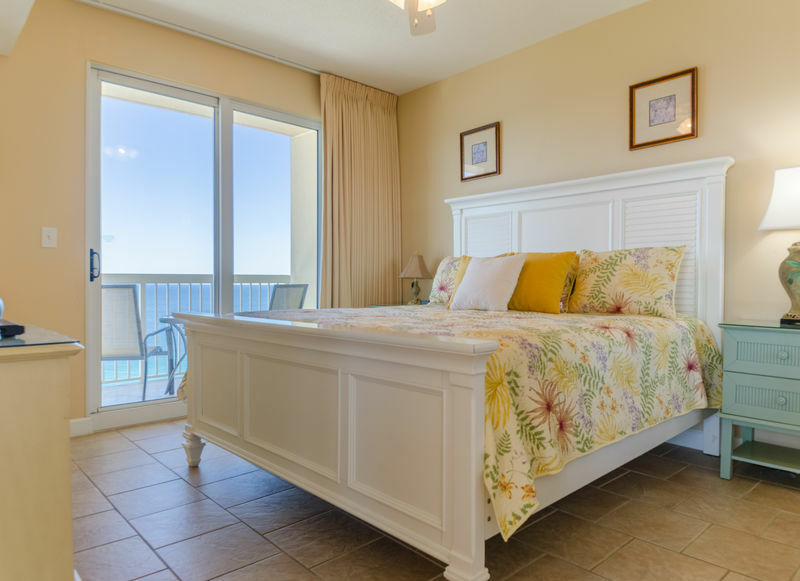 This ocean front suite has a private entry to the oceanfront balcony. A large flat screen TV and DVD player provide your own private entertainment system. 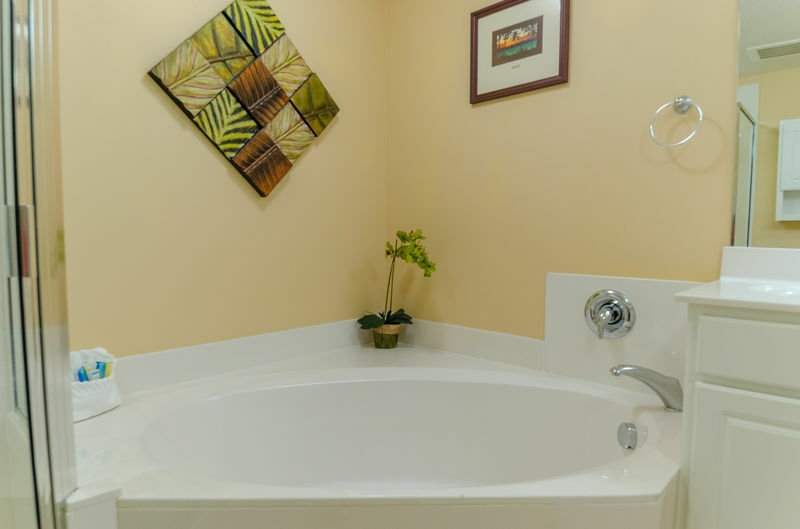 The Master Suite Bath is private with a large walk in shower with a handheld shower massage and huge garden soaking tub. The vanity has beautiful double sinks and plenty of lighting, too. The Grand Lagoon bedroom decorated in tropical style and is right on Grand Lagoon with a sliding door to access the incredible wrap around balcony any time you want to! 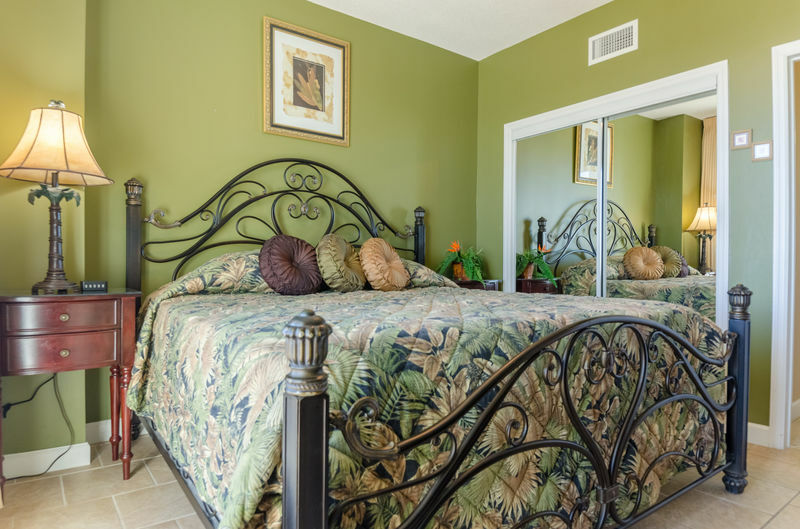 This bedroom has a comfy king-sized bed! The memory foam topper and extra fine sheets complete the total package! 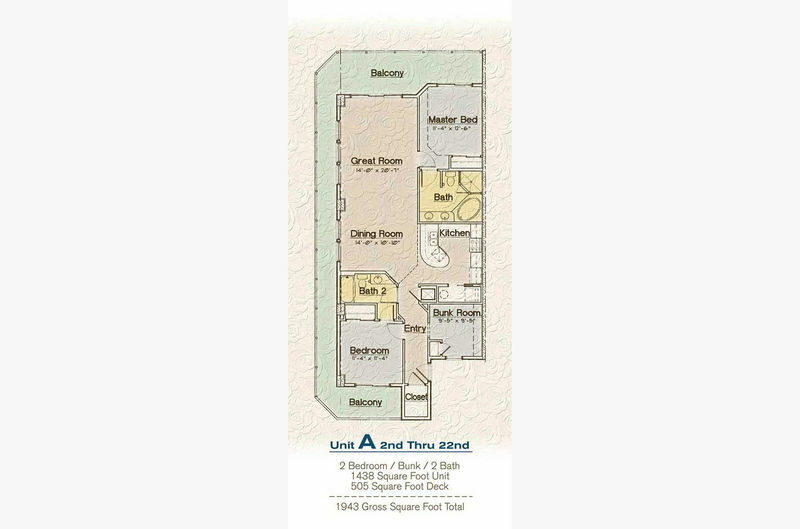 You'll love being able to walk right out on to the balcony with your own private seating area. The large flat screen TV and DVD player add to the ambience. This bedroom has a private entry to the Grand Lagoon Bathroom which is shared with the Crew's Quarters bedroom. 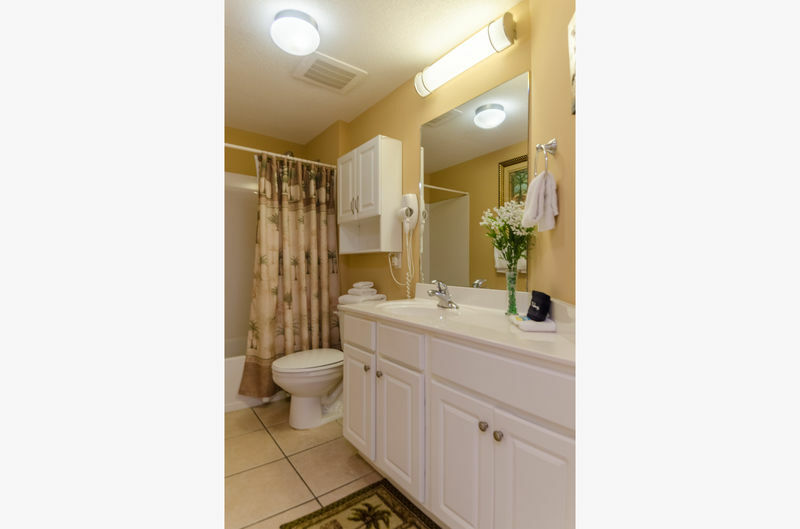 This second bathroom is a full bath with a tub/shower combo with a shower massage and a single granite topped vanity. There's a hair dryer provided for your convenience. The Crew's Quarters bedroom is perfect for the youngsters, it includes a twin over full bunk set and a flat screen TV. There is a window with a view of the Hathaway Bridge and the lagoon. There is also a chest of drawers and a closet for stashing all the kids' stuff! Bunk beds are for use by persons under 100 pounds only, please. You'll enjoy the two sparkling beachfront pools and a hot tub for your enjoyment. These are right on the beach! The fitness center is free for guests to use. The beach kiosk has chair rentals available and also parasailing and other beach activities, right in your "backyard." Parking is limited to two spaces, one is adjacent to the building in the covered parking deck and the other is provided for you in an adjacent parking lot. Why choose a luxury property managed by Emerald Beach Properties on behalf of the owner? We offer the advantages of a full service management company and vacation rental from an owner who takes pride in their property. 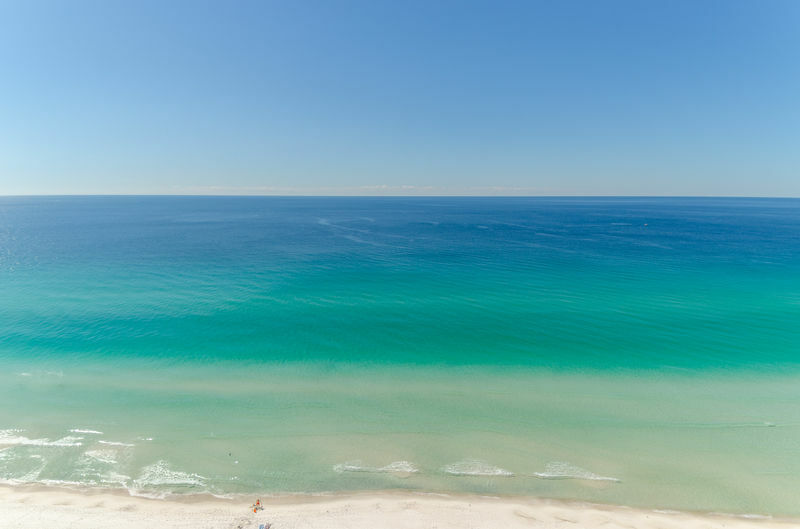 We're here in Panama City Beach, with a local front desk and local staff on call 24 hours a day, 7 days a week! 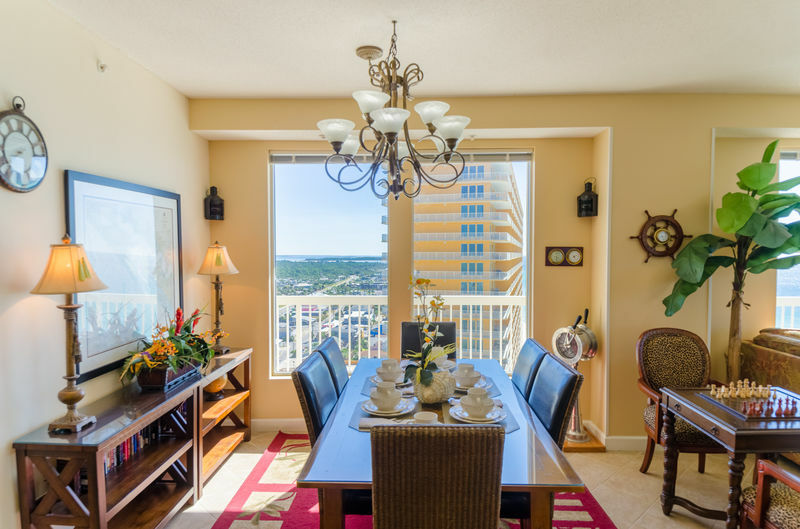 You vacation rental is professionally managed from start to finish. We are licensed, bonded and insured and all of our employees wear company ID badges for added security. We use state of the art technology to deliver secure booking and payments and quick responses to all your inquiries. Management, maintenance, rental services and housekeeping are all just a phone call or email away. Your vacation rental is professionally cleaned and maintained to our Emerald Quality Certified Vacation Rental Standards. Housekeeping is managed by our staff, all properties are double-inspected for quality assurance. Linens are professionally laundered and ironed, we use quality cleaning supplies and high temperature steam mops. We use ecofriendly cleaning practices that help preserve the earth's precious resources while providing our guests the cleanest properties around! Our maintenance crew keeps all the properties we manage in top shape. Delivering the very best vacation experience to you is our number one priority! 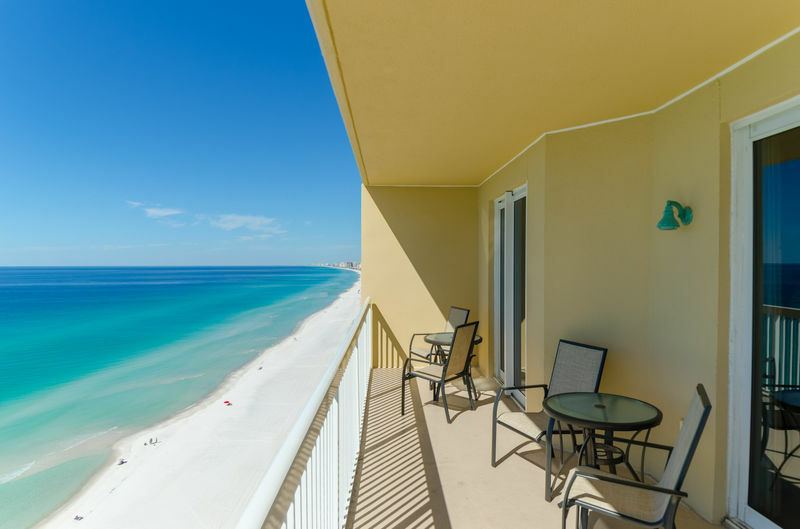 With Emerald Beach Properties, you can book with confidence knowing we'll make Panama City Beach your Perfect Place in Paradise.